With all the voice-related features offered by our mobile devices, it’s a wonder they haven’t yet developed multiple personalities. 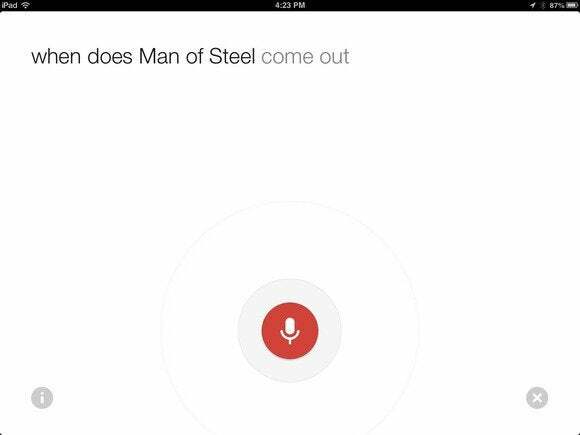 The latest entrant in the category is Google Chrome for iOS, which on Monday was updated with improved voice search. If you’re a regular Chrome for iOS user, you’ll know that Google’s browser has long had a voice search feature that allows you to speak your search terms aloud instead of typing them in. However, the new version of the app incorporates the voice search feature used in the Google Search app for iOS, as well as more recently in the Chrome browser on Mac and PC. Google announced last month during its I/O developer conference that it would be bringing its voice search to all the platforms it supports. Chrome's old voice search (left) and the new, more prominent button (right). Some of the improvements in the new voice search are largely cosmetic: Instead of the old-style dialog boxes that showed “Speak Now” and “Working,” you’ll instead see a screen where your words are interpreted in real time. The Google voice search button in the iPhone version is now more prominent, occupying a bar above the keyboard instead of a tiny microphone icon in the search/URL text field. Performance-wise, Google’s speech recognition is pretty accurate and it’s usually faster than iOS’s own built-in voice search service, Siri—for Internet search queries, anyway. Of course, unlike Siri, Google’s voice search can’t carry out tasks on your phone like reading you your messages, making notes, or tweeting for you. The second major difference between the old and new voice searches is that, in certain cases, Chrome will actually read your search results back to you. Specifically, in cases when the search is a factual matter that’s understood by Google’s Knowledge Graph; so, for example, ask when a movie comes out or how your favorite baseball team did last night, and Chrome will present a formatted box with the answer, along with a synthesized speech response. In some cases, such as movie release dates, Google Chrome will read results aloud to you. In some cases, that speech response gives it a leg up on Siri, which only answers vocally to certain topics, as Rob Griffiths pointed out when he compared the two services earlier this year. Users of Google Search won’t find much new here, but with the voice search improvements, Chrome users may now have fewer reasons to jump into the Google Search app (unless, of course, they’re also interested in the company’s Google Now service, which still lives in that app).